The church stands almost exactly at the centre of the parish, which has an estimated population of 600. It now contains the villages and hamlets of Tegryn, Star, Bwlchygroes, Llancych and Llwyndrain; The Tithe Survey (c.1830) credited it with five hamlets – Cravelli, Blaen, Blaenkerion, Cicydd and Tave; and a directory of 1875 listed ‘the small villages of Clydey, Star and Tegryn’. St Clydai, also known as Clydai Clotfaith ‘of long renown’ was the virgin daughter of Brychan Brycheiniog, one of the Irish saints who came into West Wales in the wake of the Irish raiders and traders of the fifth century. Brychan, son of an Irish king, was born about the year 400, and became ruler of Brecon. The story of his birth is given in a brief Latin version, Tewdrig was king of Garthmedryn (Brecknockshire) and had a daughter, Marchell, who was sent to Ireland, where she married Anlach, the son of King Coronac. Their son was named Brachen, later changed to Brychan. Marchell and Anlach returned to Wales with Brychan, who was fostered by Drichan. Later Brychan was sent as a hostage to the king of Powys. Brychan became king of Garthmadryn, which was renamed Brycheiniog from the name of its new ruler. He is said to have married three times, and had eleven (or thirteen) sons and twenty-four daughters. Many of the children became saints, and twenty-nine churches are dedicated to them in West Wales. Some of the children also spread into north-east and east Cornwall. 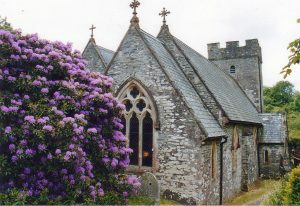 Brychan’s father, Anlach, is said to be buried near the door of Llanspyddid church, and in the churchyard is a stone known as the Cross of Brychan Brycheiniog. Corth, or Cymorth, a daughter of Brychan and a sister of St. Clydai, married St. Brynach of Nevern. It is important to understand the implications of the word ‘saint’ in this area. It does not imply so much their own personal standing, but that they devoted their lives to contemplation and prayer. Many of them would retire into some remote spot, in the manner of a hermit, but were always ready to talk and give counsel to those who sought them out. In this way they were also missionaries, and thus the Church expanded. Little is known about St. Clydai beyond her parentage and relations, but presumably she ‘retired’ to the spot where the church now stands, and there she lived. It is tempting to imagine that the circular churchyard marks the boundary of her holding; this shape is normally a strong indication of an ancient and possibly pre-Christian site. St Clydai would have been born about the middle of the fifth century, and would have been established in her ‘hermitage’ in the latter part of that century. People would have come to her for advice and instruction, and after her death we can imagine a small, wooden church being erected on the site in her memory. But the site was already sanctified in other ways; inside the present building are three inscribed memorial stones, which appear always to have been associatd with this site and which are described fully in a later section.